Here is the bigger picture! Simple and cute! I love the cloche. I have been searching more for these and the glass jars ever since coming over to blogger. I love the way they add to the decor. Have a great weekend Susie! Thanks for posting that. I meant to ask you to post a full pic yesterday, but I got sidetracked by Indy. Something about wanting food or some such nonsense. Kids! Looks fantastic. 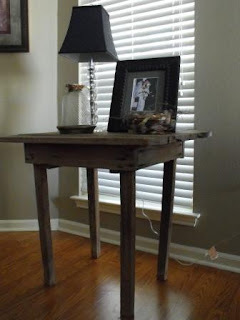 I'm sure your grandparents would be thrilled to know that you are using their table and giving it love. BTW, love the blog design. How great does that look? You really do have a way of decorating. Love seeing everything you do!!! Thanks for the pictures! Enjoy your day! looks great! love your new layout - very easy to look through... have a blessed weekend! Thanks for sharing...it looks great but then I knew it would! Thanks for the "big picture" Just perfect! Sorry I'm so demanding! I love the big picture. I just think mixing something oldish like that in with everything else adds so much more character. The thing is...I haven't done it yet. I'm thinking about bringing a chair in from my yard. Your table is perfect!! perfect with a sweet story and memory! Oh, Susie, mmmmmwah! It is just as lovely as I imagined......it looks fabulous. I like it mixed in with your traditionals!!! Hey, Susiecutie! What a sweet table from your grandmother. I love those family pieces & only have a couple of things from mine. It looks right at home there. It's like a work of art - perfection! I love everything about this vignette! And even more so that the table has such special meaning. A true treasure for sure! Love it! That table is the cutest size. I think the table is absolutely wonderful....such character it has and oh the stories that would have been told around it. LOVE IT!! So special! I love it! Oh, Susieness! I'm so glad to see the entire picture of the old table. It really looks nice and you've dressed it just right. Now, that wood floor is gorgeous! Love that lamp and black lampshade too! What a wonderful story ~ everything you touch turns out lovely! Susie..I'm just now seeing this and the previous photos. O my yes indeed this table works, and for all the right reasons!! It looks great!!!! 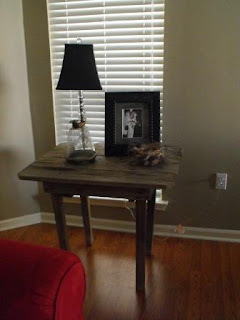 I love that table and the story behind it!! It looks awesome! The table and arrangement is beautiful! Oh, Susie, I LOVE it! It looks so perfect right there with your happies on it! That is a great table and so awesome that it has a lot of meaning! I love blending styles together like you did! love love love the old table. 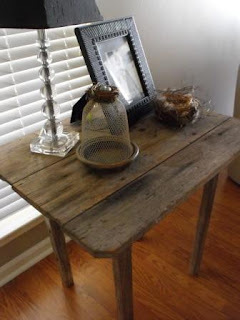 i have a hen crate for and coffee table in the great room with all the rusty screws and everything. love it! I just love it. 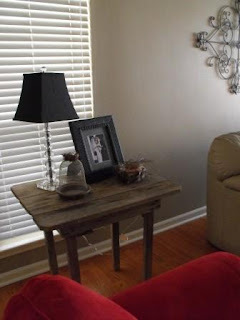 I am such a sentimental person that something like that table would always find a spot in my home. I love what you've done with it. That is such a neat table and I'm sure it is fun to have since it was your grandma's table. I have an old jewelry box from one of my grandmas. I really enjoy having it. Thanks for letting me peek from The Blessed Nest. I love your table and the fun display :) It looks like something that would be in my house!